Geoffrey?s writings strongly suggest his Welsh origins. Probably born about 1100, he became a canon, or layman associated with a college, at Oxford. His medieval best-seller, 'History of the Kings of Britain', was the first continuous account of the Britons from their beginnings until the coming of the Saxons. Instead of using factual documents to write conventional history, he drew upon Britannic myths and legends, notably that of Brutus (or 'Brut'), a Trojan descendant of Virgil's Aeneas who became the first British king, and the heroic King Arthur. His history elevated the Britons, usually viewed as barbarians, to equals of the Greeks, Romans and Normans, who ruled Wales in his time. Although sometimes criticised for not writing ?real history,? his work was extremely influential, inspiring Layamon?s Brut, Shakespeare?s King Lear and the ever-popular King Arthur literature. In the 13th century, when this collection of chronicles was compiled at the Abbey of St Benet at Hulme, Norfolk, his book would still have been a well-read history. In the prologue, Geoffrey discusses his sources. 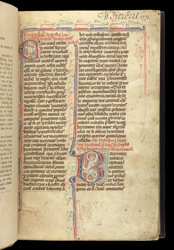 He mentions Gildas and Bede but the most important is the 'very ancient book written in the British language' given to him by his colleague at Oxford, Walter the Archdeacon, whose name is written in red and with a large initial on this page. Prologue and Chapter 1 open with letters decorated with exotic beasts. The eccentric 18th-century London bibliographer, William Herbert, signed in the upper margin.